You are here: Home > Media > Blog > Is the gender pay gap on the brink of closure for young women today? Is the gender pay gap on the brink of closure for young women today? A common challenge to those – like us – who spend time voicing our concerns about the lot of today’s younger generation is a simple question: would you rather be born in 1960 or 1990? The argument runs that even millennials on modest incomes have smartphones that a boomer could only have dreamed of at the same age. They benefit from the opportunities for dialogue and travel brought by technology and globalisation. And they are freer and more equal than any generation before them. We argued when launching our Intergenerational Commission that – from a living standards perspective – there’s still plenty of evidence that should make us worry about millennials’ futures, compared to that of their predecessors. ‘Big ticket’ items like a house, a job with progression and a decent pension are eluding too many. But even sticking with this limited living standards focus, there’s a good reason why my half of the population would probably still choose to be born in 1990 rather than 1960: the rapid improvement in women’s position in the labour market. Our previous analysis has shown the progress in female employment rates through the generations. But we see the improvement in women’s position even more clearly in what’s happened to the gender pay gap, which is summarised in the chart below. Now before we delve into these results we should say that we know the gender pay gap isn’t a perfect measure. By comparing the typical pay of all women and all men it obscures the fact that these two groups differ in their characteristics and the jobs they do. And therefore it mixes together positive choices than women make about the balance between work, education and other things with constrained career decisions and straightforward discrimination. Nonetheless, the pay gap – particularly when disaggregated by characteristics like age – remains a good tool for understanding the gender implications of how we organise work in the UK, and how these have changed over time. And the progress is most definitely in the right direction. The gender pay gap has closed for every generation of women since the greatest generation – those born between 1911 and 1925 – and has done so at every age of their working lives. Focusing on the more recent generations during their 20s, we find that the gap fell from an average of 16 per cent for baby boomers, to 9 per cent for women in generation X, and then nearly halved in a generation to just 5 per cent for millennials. This generational progress on gender pay differences will reflect a number of welcome trends including equalities legislation that millennial women’s mothers and grandmothers fought for, maternity rights and welfare support, and rising higher educational participation which women in particular have benefited from. All this has meant more women breaking into high-paying occupations, and staying in them. However, the other thing that stands out from our analysis is the variation in the pay gap by age, in particular the big increases through the 30s and early 40s.The key factor here is that women start having children. The pay gap widens partly because mothers take time out altogether and so lose out on labour market experience. But it’s also connected to the fact that training, progression and promotion are much harder to come by when working part time, which many women with children either choose to do or feel they have to because of high childcare costs. This increase in the gender pay gap isn’t just a short term phenomenon closely linked to childbirth either – it continues for decades. This is where the lifetime earnings penalty that women continue to face really starts to build. 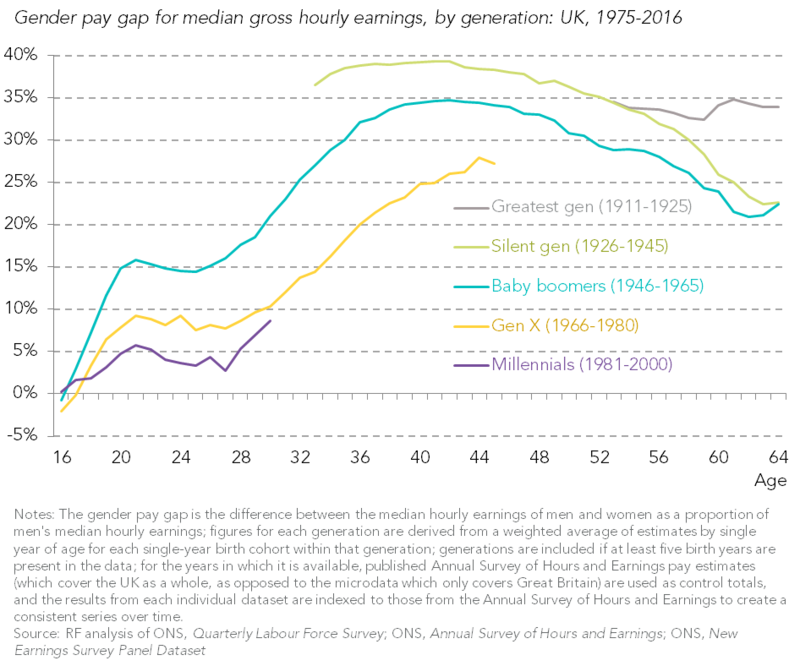 And what’s really interesting from our new analysis is that here the generational progress on gender pay shows signs of stalling. The pay gap at age 30 was 21 per cent for baby boomers, then halved to 10 per cent for women in generation X. For millennials age 30 it’s 9 per cent, only a touch lower. The suggestion is that the old challenges associated with having children endure for young women today. So millennial women should still expect to face a significant lifetime earnings penalty compared to their male counterparts. Young women today know that we have rights and opportunities that our grandmothers would envy, and that like men in our generation we benefit from the living standards improvements, technologies and global connectedness that continued growth and human progress have brought. But we also know from the statistics that we’re likely to spend more of our (longer) lives than women in previous generations reliant on our own earnings alone, and that reproductive biology remains what it always was despite everything technology has done. So while we should celebrate generational gender pay progress, a continued focus on gender differences at all stages of careers – and in particular action to address the sharp and long-lasting earnings penalty post-childbirth – remains a key challenge of our times. Notes: This work contains statistical data from ONS which is Crown Copyright. The use of the ONS statistical data in this work does not imply the endorsement of the ONS in relation to the interpretation or analysis of the statistical data. This work uses research datasets which may not exactly reproduce National Statistics aggregates.